Looking for a fun and kitschy way to infuse some vintage vibe into your kitchen? There is a certain warmth and cozyness to a farmhouse or country kitchen and dining area. This timeless style makes the food seemingly prepared more lovingly. And with this current revival of vintage and retro aesthetics in interior design, many of us have been looking for ideas on how to incorporate this trend into our homes today. The Kitchen is where the family meals are made, so give yours a sense of warmth and retro fun with the Goodscious Mason Jar Ceramic Utensil Crock. 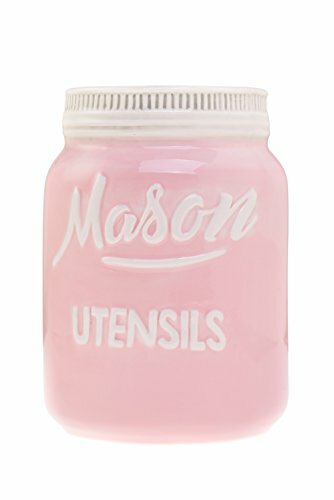 This vintage inspired Mason Jar Ceramic Utensil Crock will make organizing your kitchen so much fun! All your favourite and most used kitchen utensils can now be put on display in this cute vintage inspired Utensil caddy. Put in your wooden spoons, spatulas, ladles, and even whisks for easy accessibility - you'll free up cupboard space too. An excellent alternative to Comfify, Sparrow Décor, and Fecihor, the Goodscious Kitchen Ceramic Utensil Crock is made from high quality materials that are durable. Not only decorative and collectible it is functional - helping to organize your kitchen and utensils. It also makes a great gift for the budding chefs on your christmas list or the retro loving friend or collector family member. Here are some more details about the Goodscious Mason Jar Ceramic Utensil Crock: ✅ Available in many colors : Turquoise blue, red, white and pink. ✅ Dishwasher and Microwave Safe. ✅ Dimensions - 5 inches (Diameter) and 7 inches (Height). Bring the treasures of the past back to your kitchen by adding the Mason Jar Ceramic Utensil Crock to your cart TODAY! ✅ COLLECTIBLE & DECORATIVE - This mason jar ceramic kitchen utensil holder is the perfect collectible for every retro inspired kitchen. It's the perfect countertop decor and can fit your rustic, farmhouse, country, & even vintage style kitchen! ✅ FUNCTIONAL - This cute mason jar inspired kitchen utensil caddy was designed not just to be decorative but also highly functional. Keep your most used utensils organized (and your kitchen neat) in one place to save you cupboard space. ✅ LASTS A LIFETIME - Meticulously crafted from premium, high quality ceramic, this utensil crock are durable; treated to resist chipping, staining and fading and will look lovely even after many years of use. Click on "Add to Cart" Today! ✅ EASY TO USE - Designed to make your life easier, this mason jar inspired utensil crock is completely dishwasher- and Microwave-safe. Its wide mouth keeps your utensils on hand and its wide base keeps it stable to prevent it from falling over. ✅ MONEY BACK GUARANTEE - Loved ones and collectors will enjoy receiving these Mason Jar Ceramic Utensil Crock as birthday, mother's day, Christmas, wedding or housewarming gifts! We're so confident you'll love it that we offer 30-day guarantee! If you have any questions about this product by Goodscious, contact us by completing and submitting the form below. If you are looking for a specif part number, please include it with your message.